Homeowners desiring to turn their backyards into a personal oasis often opt for installation of vanishing-edge swimming pools. Otherwise known as negative-edge swimming pools, this style of pool provides a gorgeous addition to any outdoor living space as long as it has been properly constructed. However, consumers often end up with disappointing results when a contractor lacks the requisite experience and understanding of how this particular design works. 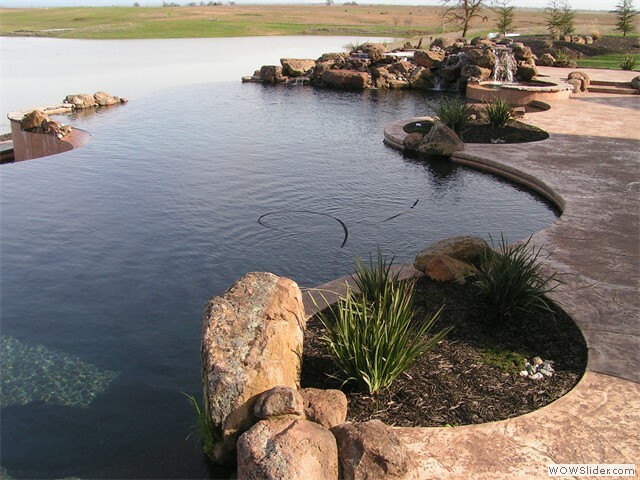 Following are five common errors involved in the swimming pool building process of vanishing edge pools. One of the major components in the aesthetic beauty offered by vanishing edge pools is the optical illusion that tricks the eye into thinking that the water's edge goes on forever. For this reason, the formation of the edge of the pool has to be as level as possible -- even slight fluctuations can ruin the illusion. Inexperienced contractors often struggle with attaining the precise dimensions and levels necessary for crafting an optimal edge effect. Some contractors erroneously use plaster as waterproofing on both sides of the weir walls, which almost always results in premature erosion of the underlying material, while others forgo waterproofing altogether on pools made from concrete because they believe that concrete doesn't require it due to its superior density. However, because of the unique properties of weir walls on vanishing edge pools, effective waterproofing agents designed for use on each individual side of the weir considerably prolongs the overall life of the wall. Because the inner side is constantly subject to moving water, it needs to be treated with a waterproofing product created for that specific condition. The outer wall of the weir experiences significant sun exposure and therefor has a higher surface temperature than its inner counterpart, and therefore needs a different type of waterproofing agent. Waterproofing should be applied for the tile is set. Inexperienced contractors often underestimate the amount of width necessary for the catch basin to do its job properly. Basins that are overly narrow allow may work under ideal circumstances, but weather conditions such as even fairly slight breezes may cause the water to end up on the ground next to the pool rather than in the basin. Catch basins that are undersized and too narrow also may fail to hold enough water, causing it to overflow. This situation often worsens when there are multiple people enjoying the pool. Water leveling systems that are improperly placed are another major problem many contractors struggle with when installing a vanishing edge pool. Inexperienced contractors sometimes put them in the upper level of the pool, but they need to be placed in the catch basin in order to properly do their jobs. The majority of problems that occur with vanishing edge swimming pool installation is the result of contractor inexperience. Because of the number of hydraulic and structural challenges involved, homeowners should protect their investment by using the services of a swimming pool contractor who is experienced with this type of project. Please feel free to contact us at your convenience for more information on making the most of your vanishing edge swimming pool.